This Kreature is the meta-form of Kooble. Intelligent and social by Kreature standards, its kind will huddle together in groups for warmth while sleeping. It hides in caves during the day, using its suction cup feet to hang from the ceiling. Its antennae can detect the brainwaves of predators and prey alike from over 50 meters away. 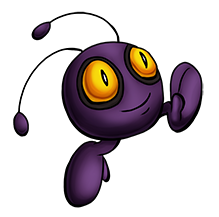 Its mind shock ability can give its target temporary amnesia, but it’s less effective the more it’s used; it will unleash a single full-powered blast and then counterattack or escape.